A copy of the highly anticipated space exploration game No Man's Sky has reportedly been sold online two weeks ahead of its official release. One member of online discussion forum Reddit claimed to have paid $1,250 (£949) to secure an early copy on an online auction website. He has since published a series of videos showcasing in-game footage. The game's creator Sean Murray has asked fans to avoid reading spoilers posted by those with early copies. 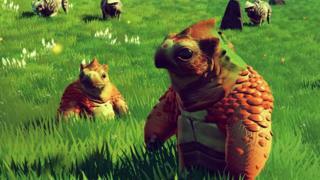 "We've spent years filling No Man's Sky with surprises. You've spent years waiting. Please don't spoil it for yourself," Mr Murray wrote on Twitter. "Take a break from reading about it and picking vids apart. You can experience it for yourself so soon." Following the leak, some fans have suggested that the game can be completed in around 30 hours - despite the developer's claims that it could take "hundreds" of hours to finish. Players begin the game at the edge of a universe that is said to be populated with 18.4 quintillion planets. The goal is to reach the centre of the cosmos - and what lies there has remained a closely guarded secret. One Reddit poster called Daymeeuhn suggested players could fast track their way to the core. "Contrary to what a lot of people think, I have done a lot of what the game has to offer. I actually intentionally took time out of my warp jumping... to break up the monotony of it," he said. "This does not mean I have done all of the major events, however. I am still yet to swim to the bottom of a big ocean. I am still yet to destroy a space station. I definitely still have stuff to do." In a recent interview with gaming news website Gamespot, Mr Murray said that the journey to the centre of the universe would take "hundreds of hours", even if players did nothing else. "People feel really insignificant, and that's how we want them to feel. We want them to feel vulnerable. We want them to feel like a tiny part of this universe," he said. "But, actually, as you upgrade your ship and upgrade your suit and your weapons and stuff, you can travel much further, much easier and you can take shortcuts as well. Suddenly that galactic map seems less daunting, but it's still a really significant challenge. It's hundreds of hours of gameplay." No Man's Sky is due to be released worldwide on 12 August.